The BlackBerry Curve smartphone is the most popular BlackBerry model sold by Research in Motion. It boasts an optical trackpad, dedicated media keys, easy media sharing, Mac compatibility, iTunes synchronization, a camera, Wi-Fi calling, and extended battery life—to name just a few features. 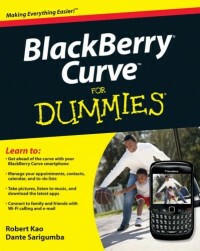 This fun, friendly, and easy-to-understand book is a practical guide to the BlackBerry Curve and covers an array of how-to topics to help you get the most out of this exciting handheld device. You'll learn the parts of the Curve, how to navigate the QWERTY keyboard, set up contacts and make appointments, download the latest applications, take great pictures, take advantage of the expandable memory, and much more. Avoid the learning curve with this helpful guide to the BlackBerry Curve!